For many patients, learning their condition requires surgery can be a very difficult time. Concern over finding the right surgeon, undergoing the correct procedure, and taking extended time away from work are just a few of the issues that can cause unnecessary stress. The good news is that many surgical procedures can now be performed with minimally invasive laparoscopic surgery. The doctors at our New York practice have pioneered the use of minimally invasive surgical techniques since the early '90s. Their experience and expertise have helped develop treatment plans for thousands of patients who benefit from the many advantages that laparoscopic surgery has over traditional procedures. To learn whether your procedure can be performed laparoscopically, schedule a consultation with one of our doctors today. In the past, minimally invasive techniques were used primarily for gynecological surgeries, but are now being used as the preferred treatment for many conditions. During laparoscopic procedures used to treat diseases and conditions of the abdomen, instead of the large incision used in traditional surgery, your surgeon will create a series of small (1/2-1 cm) incisions near the belly button. 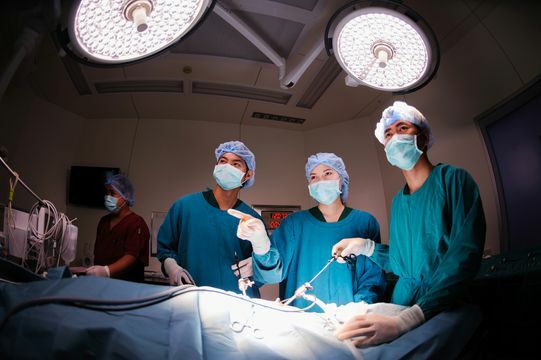 Telescoping tubes equipped with a small video camera (laparoscope) and surgical instruments are introduced through these openings and used to perform the surgery. The abdomen is inflated with carbon dioxide to give the surgeon enough viewing space and room to maneuver the instruments inside the body. Throughout the procedure, the surgeon watches the images from the laparoscope on a monitor, and manipulates the instruments to perform the same internal procedure as traditional open surgery. Our laparoscopic surgeons were among the first in the state to begin using this technique when it first became widely used in the medical community. Together, they have over 30 years of combined experience performing minimally invasive procedures. This level of experience and familiarity means that they have performed every type of laparoscopic surgery hundreds of times and their patients know that they are in the most adept hands possible. It is important for the patient to have direct lines of communication available to speak with their surgeon - not just an assistant or other member of the team - throughout every stage of their care. Our surgeons pride themselves on the level of availability and access given to all of our patients. Patients have access not only to their doctor, but to everyone in our entire practice. We are completely committed to our patients' health and safety, and providing them with the best possible outcome. Choosing the right surgeon is a very personal decision and our doctors do not take the responsibility of care lightly. To learn more about laparoscopic procedures and how you can benefit, contact our office and schedule an appointment today.